A new chapter has been written today on the discussion as to how the listed real estate sector (property stocks) resembles to or correlates with direct real estate (bricks and mortar investments). According to the latest research published by the European Public Real Estate Association (EPRA) in association with US investment firm Cohen & Steers, real estate stocks generally lead moves in the underlying direct property market by an average of six months. The Cohen & Steers study not only provides evidence that listed property markets lead direct property markets, but also adds to a mounting body of research that supports the idea that real estate stocks behave like real estate, not general equities, though with better transparency and more liquidity. The notion that the listed sector leads direct property markets, both up and down, I am happy to accept. The second outcome of the study however, I find hard to believe. I am very happy that this study study adds to a ‘mounting body of research’ evidencing that real estate stocks resemble real estate itself, because for me, it is counter-intuitive. I have learnt and seen that property stocks ≠ property. So, for me, it is somewhat hard to accept that propertystocks have such high a correlation with direct property investment and that real estate stocks are even behaving like real estate. What I have always learned and experienced is that propertystocks indeed do have certain characteristics in common with investments in ‘the real thing’. For instance their high dependence upon interest rate fluctutuations, occupier demand, construction costs levels and certain macro economic circumstances. But all these resemblances and high correlations put aside, there are some specific elements differentiating property stocks from property itself. The most important element of which: stock market sentiment. Before I come to that, let’s see what the EPRA-commissioned study had to say about the difference between listed and unlisted property. …listed markets experience higher peaks and lower troughs than direct markets. Cohen & Steers speculates that this relates to the fact that the returns of the listed property series incorporate leverage, while the direct property series does not, even though direct investors also use leverage. Listed property prices immediately incorporate changes in variables which affect asset value from the macroeconomic, such as interest rates and oil prices, to the microeconomic, like expectations for rents and capitalisation rates. Valuing direct property is much less transparent because it is valued infrequently and appraisals are based on a small number of transactions. True value is not determined until the property is sold. In my opinion, this argument holds. Actually, the opacity of most direct property markets builds a case against direct property and in favour of listed real estate (and actually confirms that direct property differs from listed property, but alas). 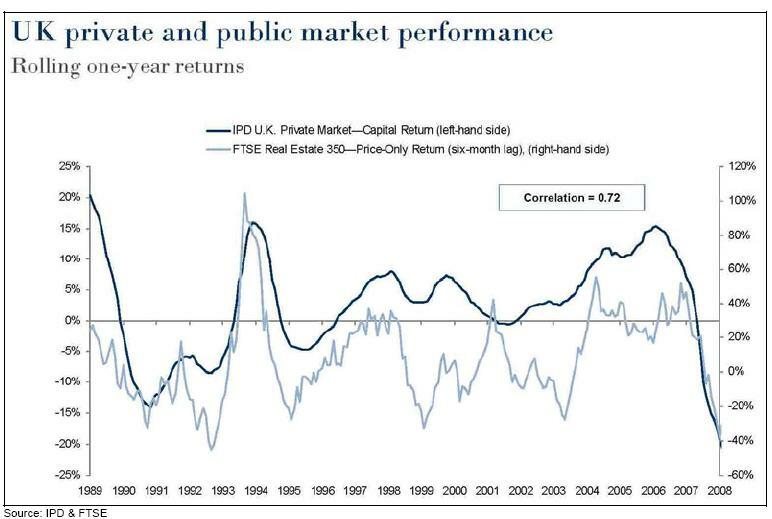 From the study may be derived (which is also illustrated in the press release) that direct property (IPD UK private market capital return) has a relatively high correlation (0.72) with indirect property (FTSE RE 350 price only return) with a six month time lag. Therefore, I must admit: the listed sector is a fairly good predictor of the direct property sector. The listed property sector takes a 6 months advance on the direct sector. To me, this resembles what is said for the stock market in general: it leads the real economy by 6 to 9 months. Now, take a closer look at the diagram to the left (source: EPRA press release, as above). The (lagged) listed market matches the direct market quite closely, which is also being indicated by the 0.72 correlation between the two. However, you have to bear in mind that the scales differ. The left scale (direct market) differs quite substantially from the righ scale (listed market). This emphasises what has been previously mentioned: peaks and throughs are higher and lower in the listed sector, respectively, as opposed to the direct sector. The difference is huge, even if you alow for time lagging. This phenomenon has implications for listed property firms themselves. Their direct property portfolio (bricks and mortar assets that they own) is being valued in a stock exchange environment. In almost every case, this leads to a price mismatch. This is referred to as a premium respectively discount to NAV. I have covered this subject before and pointed to the NAV discount/premium that Reita calculates for the EPRA UK Index. As can be seen, property stocks are traded at substantial discounts these days. This brings about tremendous opportunities for value-oriented real estate investors. In my understanding of things, property is a solid investment and a stable asset class by nature. Property may come across some price fluctuations over time, but is likely to grow in the long run and is unlikely to ‘vaporise’ like some corporates tend to do. Land and buildings are very tangible and always represent a certain value. That said, the listed property sector fluctuates substantially (see evidence above). These substantial fluctuations may be a result of higher liquidity and higher transparence, but are clearly driven by market sentiment. Such sentiments, like fear and greed and other animal spirits, lead to stock price overshooting. As long as you believe in a certain stability of property values in the long run – like I do – here’s a suggestion: benefit from the current price mismatch. Ask me how. How would you benefit from this mismatch? Listed property is a great example of both the wisdom and the folly of crowds. As listed property is valued by thousands of investors every day, it would be inconceivable there would be a structural deviation from fair value. Otherwise they would be delisted. Property cash flows do fluctuate, but not as much as the ‘sales’ of most companies, and should therefore be relatively easy to value. However, on the short run, investors can clearly get overly excited about the prospects in the forseeable future. Group think causes equity investors to follow the crowd into the most compelling “story” of the decade (IT or Emering Markets etc). When the pendule of the business cyle swings the other way, they remain optimistic for too long, untill they can no longer stand the pain of underperformance. This moment of capitulation is a great time for investors focussed on value in stead of the story to step in.